Australia is 15,696 kilometres away from Ireland. The country has a hot climate and some amazing beaches and is home to nearly half of the previously-unemployed Irish people. On a large map of the world it looks so far away you have to turn your head to see the distance between it and Ireland. How many of you reckon you could travel to Australia with no money and no plan of action but to try and get as far away from Trinity College Dublin as possible? 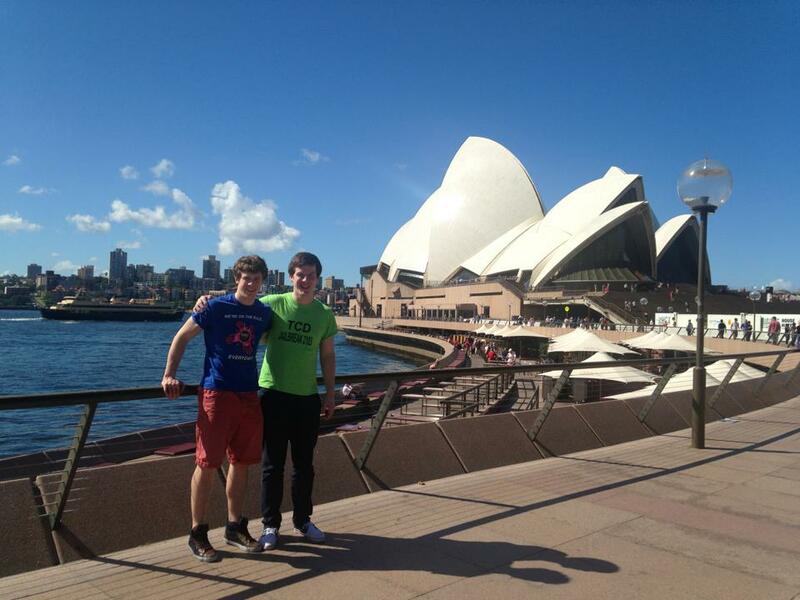 DCU student Tommy Browne and Jack Cantillon from Trinity College achieved that feat when they took part in the Trinity Jailbreak Challenge 2013. The challenge saw 40 teams of two people strive to raise money for charity by attempting to get as far away from Trinity College as possible in 36 hours without using their own money. The charities were St. Vincent de Paul and Amnesty International. The College View spoke to Tommy Browne, an International Relations student in DCU, who teamed up with friend Jack Cantillon to take on the exciting jailbreak challenge. “The night before it started we were given a briefing on the rules and what to do if we ran into trouble etc. Some teams seemed very confident, as if they already had something sorted up their sleeves, while others hadn’t a clue what to do – we definitely fell into this category. We had absolutely no plan whatsoever, but we were very confident in our ability to spoof”, said Tommy. Teams had a few weeks beforehand to organise sponsors or get donations from people to pay for their flights and there were some hot contenders for the task: one team had a strong connection with the United Nations and another had a relation who was a pilot. Strong connections and contacts would help with this challenge. however Tommy and Jack used their sheer ‘blagging and social skills’. “When we met in Trinity courtyard a lot of teams headed straight for the airport”, Tommy said. “Jack and I however decided that we would go to Temple Bar with a sign saying ‘Get us to JFK’ and hopefully get talking to some Americans who might find it funny, donate some money, or even spare us a few of their air miles”, he said. When this didn’t work the boys went to the pubs chatting to everyone they met. “We went around like ping-pong balls, to every pub, just chatting to anyone and everyone. We told them exactly what we intended to do with their donations, what the cause was, and we answered any questions they had. At a couple of stages we managed to have a substantial number of people tentatively listening to us”, Tommy explained. Summing up the feat of trying to persuade people to help them on their journey, he said “it was the most sociable I have ever been in my life”. That evening the boys counted their money and they had raised almost €300. They logged onto the internet and started looking up flights, soon establishing that the furthest away from Trinity they could get to with €300 was Zurich in Switzerland. “We didn’t hesitate, we just booked it”, Tommy said. “We thought we could get to Zurich and then get a train as east as we could, maybe to Liechtenstein and get a picture with the Prince of Liechtenstein”. There was a prize for the team who would get the best photo on their travels. On the plane to Zurich the boys walked up and down the plane (in between the seatbelt signs) and spoke to as many passengers as they could about their challenge. As their plan was to travel east towards Liechtenstein, their main question was “excuse me, are you driving east?” They got speaking to a number of people and one man told them he would drive them east whist another lady was very interested in the boys’ plight but waited until the plane arrived in Zurich until she approached them with her proposal. Whilst on the plane Tommy recalls having no money and having to ask people for food. “Sorry are you finished with that roll, do you mind if I have it?” being just one such example. “We lost all our inhibitions”, he said. When the plane had landed, an individual approached them and said she wanted to give them air miles to anywhere in the world. They couldn’t believe their luck. He recalls how “the next 10 minutes after that were the most surreal of my life. We were looking up flights to everywhere: we were defiantly off to South Africa, Shanghai, Japan and even Indonesia”. The pair decided on Sydney because it was the furthest away from Trinity College that they could get. They flew from Zurich to Frankfurt and then onto Singapore. When they arrived in Frankfurt they had 45 minutes to get to the right terminal, get a visa, get their tickets and get a flight to Singapore. Tommy described the experience as being “very touch and go at one stage”. The journey ‘down under’ took over 38 hours – as they hadn’t reached their destination in 36 hours they were ruled out of contention to win the challenge. The boys continued on regardless as they wanted to raise as much awareness as possible for the two charities. Whilst in Sydney, the head of Amnesty in Australia flew to meet the boys in Sydney. Dublin radio station 98fm also rang them to do an interview over the phone. They were definitely creating media attention. Luckily the boys knew a few people over in Australia (who doesn’t nowadays) and managed to get accommodation with friends when they arrived. They went to the Sydney Opera House, Bondi Beach and lived the relaxed Australian lifestyle before having to come home the following Monday. “When I was on Bondi Beach I went to hire some surf boards and the guy working there was from Malahide. We spoke about how we had some friends in common and asked me if I had heard about the Irish guys that got over here for free. I said ‘yeah that was me’ and he gave me the surf boards for free. People were so generous”, Tommy explained. A favourite reaction of Tommy’s was from the woman behind the check-in desk when they told her they weren’t checking in any bags, despite the fact they would be travelling over 10,000 kilometres. She said, “you do know you are going to Australia”. Tommy admitted he would have been more prepared for an afternoon picnic. Looking back at his adventure on the other side of the world, Tommy “still gets moments where I think ‘Wow’, especially over the past few days as it has been snowing outside”. When questioned about whether the experience would motivate him to travel more, he replied “yes, to travel more for free”. “As a whole I have been very moved by how thoughtful people can be to total strangers”, the DCU student concluded.